Travel Tuesday: Chicago | Que Sera Sara? Chicago, like most urban centres, can be carved up into smaller pieces: neighbourhoods, districts, regions, each defined by some homogeneity be it geographical, cultural, or historical. In some ways the city can be redacted into two halves. Lots of people are divided by which side of the river they live on; which baseball team they support; which pizza joint the worship; but like any surging mass of humanity, the sum is much greater than is bits and parts. Chicago’s got big city glitz and small town charm. The lake effect creates unbelievably beautiful and verdant summer days, as well as the deadly snow drifts and cutting winds which give the town its nickname. Great parks, fabulous museums, quirky neighbourhoods and a skyline to die for, Chicago is one of those towns that captures your heart and excites the imagination. My beloved people of Midwestia often say it’s like a slightly smaller New York. Only everyone’s nice. And it’s clean. Chicago is where I grew up in many ways. Where my first big city adventures and my best school fields trips inspired the cultural professional I am today. Where, like any poor college kid, I scrounged nickles in the sofa to pay my EL fare. Where I first went to gigs with bands no one has ever heard of and drank microbrewed beer. Where I spent a languid, lonely summer of sophomoric ennui questioning everything in existence while hardly ever leaving my sister’s studio apartment. And long before I became a children’s book guru, it’s where I once helped run a midnight Harry Potter launch party that spanned several city blocks. I went hoarse adjudicating a wizard’s duel between fervent 12 year olds in front of a screaming crowd of what seemed like thousands of costumed fans. I love Chicago with a ferocity I never expected. Now it is one of the places I most look forward to sharing with Bean. 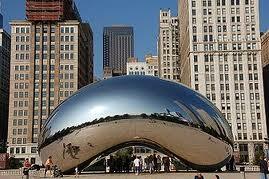 … and not just because of Anish Kapoor’s giant sculpture on the waterfront, which is really called Cloud Gate but everyone knows is a Giant Bean. The picture of Chicago that hangs on our wall in Edinburgh is totally a reminder of my Chicago, that old Chicago, and all its earthly delights. But it’s more than that, too. The image in our collage isn’t just a photo or postcard. It is an extraction; a wonderfully minimalist view of a multi-faceted metropolis; a crystal distillation of the Big City in rainbow-hued, picture book simplicity. 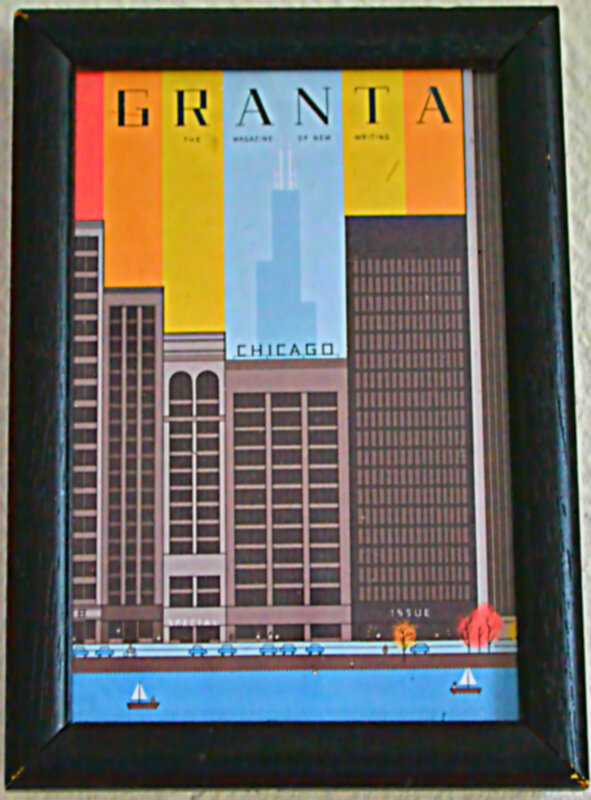 It is also the cover artwork from Granta’s Chicago issue. Granta is one of those amazing (and rather full of itself) literary magazines. In every issue I find much to love and usually at least one thing to curl my lip. It’s a wonderful publication that simultaneously inspires me to be a better writer and reminds me of all that’s wrong with the politics of the literati. Someday I will probably subscribe unironically. But I am getting ahead of myself. … and quite by accident one serendipitous and frantic afternoon, as I shuffled through said mountain, this little card crashed old memories of home back into my work-a-day mayhem. I could feel the lake breeze and smell the barbecues. I could hear the traffic on Lakeshore and the tinkling carnival music of Navy Pier. I could see the Institute of Art and my great-uncle’s textiles warehouse beneath the Sears Tower. From this one little picture I can feel Chicago in my bones, though I haven’t seen it in the flesh in years. And that afternoon it made my heart ache for half-forgotten charms. This card seems prescient now. If I was feeling particularly grandiose, I’d wonder if its arrival was the ripple which started the tsunami of my extrication from that life and the beginnings our immigration. Today all I know is that this picture is both a reminder of the wonderful Windy City I used to know and of the life I built very far from its shores, which I then outgrew like snakeskin. And only with both halves together can I begin to tell my full story in crisp, magical Technicolor.